100 PLAIN 3/4″ TYVEK WRISTBANDSTyvek wristbands are often given to attendees at events such as music festivals and gigs, as well smaller venues as an access control measure.These are ideal for security and identification. One size fits all and no more stamping peoples hands. 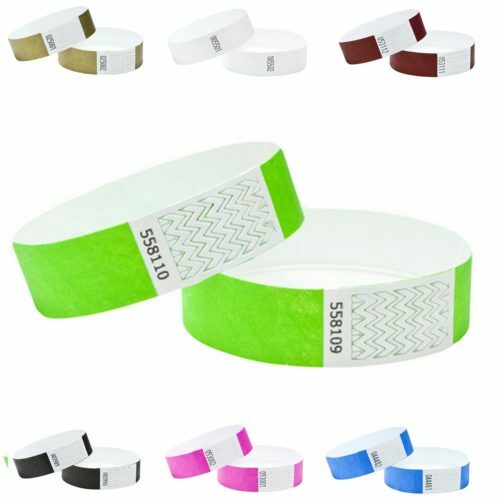 Tyvek wristbands are made of fibers that are tear and stretch resistant while at the same time being waterproof meaning that they can be used for a wide variety of uses including swimming pools and water attractions.The wristband is easily applied to the wrist using a high quality adhesive strip which makes it fully adjustable, comfortable to wear, and ideal for children. Many of our customers use Tyvek wristbands for parties, festivals and groups.Simply place round the wrist of your customer, make tight enough so it isn’t loose, then pull off the glue protector and stick. The peel & seal system is tamper proof and non transferable. A “www” pattern is disrupted when the ends are praised apart.All bands have a six digit security code and are sequentially numbered.What are Tyvek wristbands used for?Theme ParksConcertsNight ClubsSporting EventsID BandsSchool outingsCharity EventsPartiesWe do not import our wristbands, they are the finest quality hence we do not offer standard wristbands, they are premium quality. We do not offer a grey scale print as we only use digital print that is crystal clear and will not fade or smudge when used in the rain. They can be written on but we would recommend indelible ink. OUR PROMISE – We offer the best Tyvek Wristbands at the lowest possible prices. Some sellers can promise to match or sell slightly lower but be wary of the quality of the product. They have premium and standard quality, we only sell premium products.